Carol Wilson is having the time of her life... and it's in her garden. 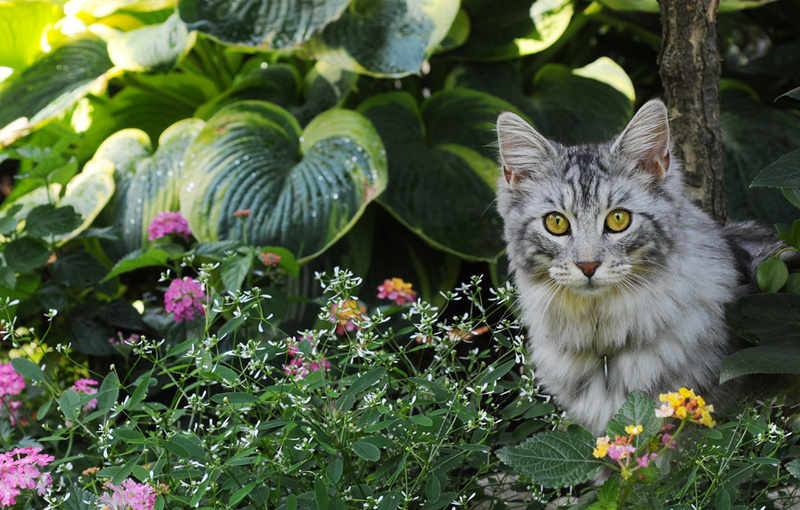 Murphy, the cat, steps out from a large hosta and is ready for his closeup in Carol Wilson's University City garden surrounded by "Diamond Frost" euphorbia and citrus-colored lantana. 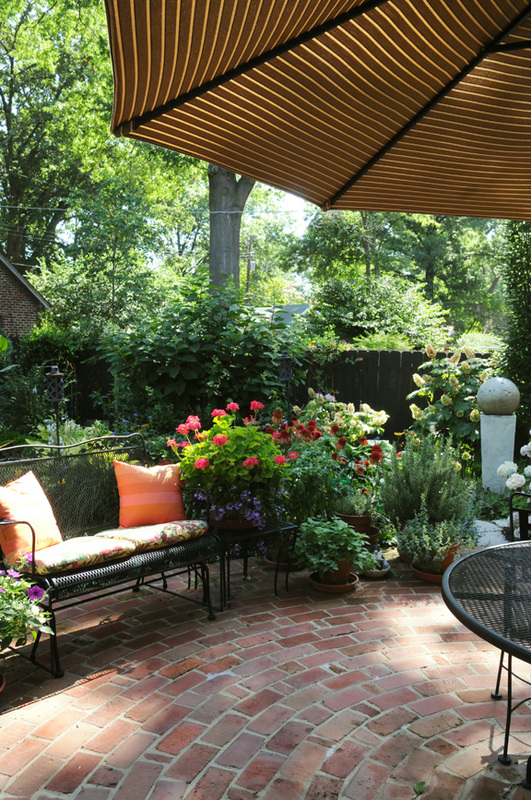 The circular brick patio provides the centerpiece for outdoor entertaining. 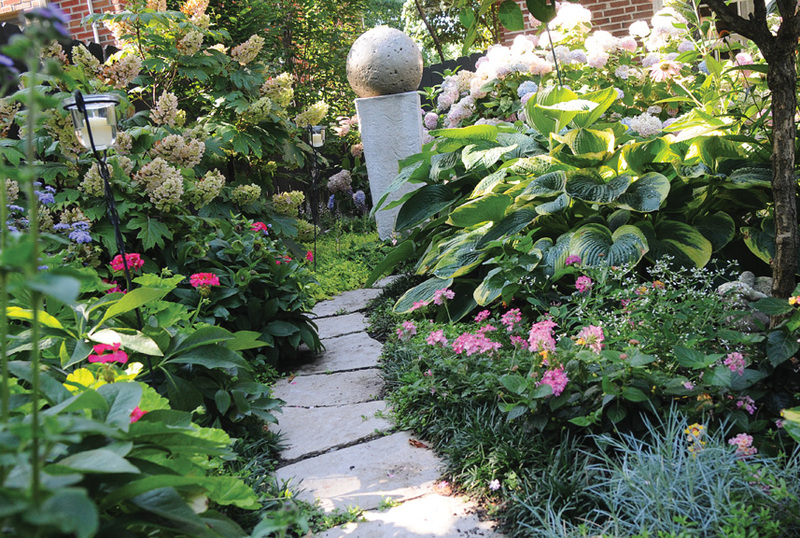 Flagstone pathways, lined with annuals such as fluffy, white "Snow Princess" alyssum, tropical hibiscus, and training lantana add shots of color and are backed by foliage plants and perennials such as coneflowers. 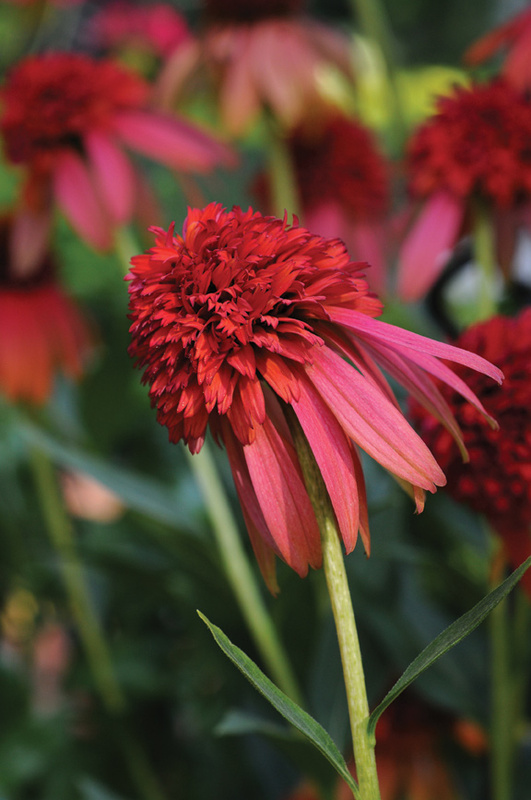 A recently introduced, double, red orange coneflower "Hot Papaya" adds punch to the garden. 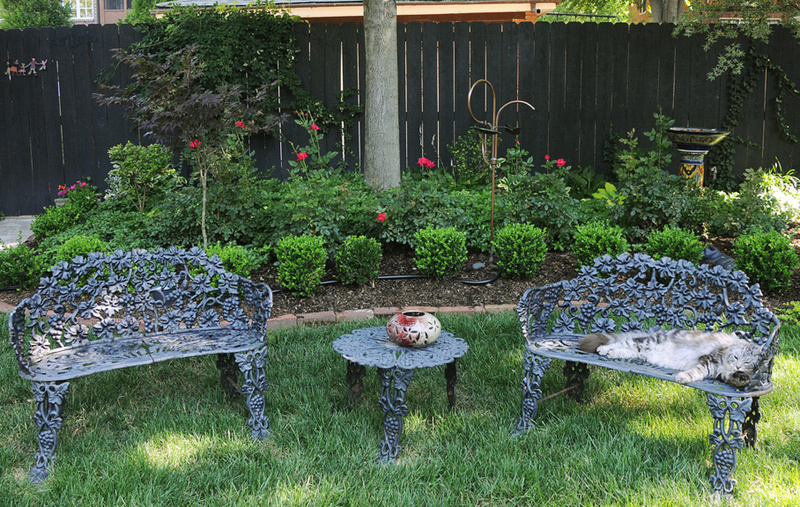 Rows of boxwoods define the sweep of garden beds as Murphy takes a snooze on a garden bench. St. Francis of Assisi welcomes visitors amidst laurels, hydrangeas, snow on the mountain and trailing gold lysimachia. 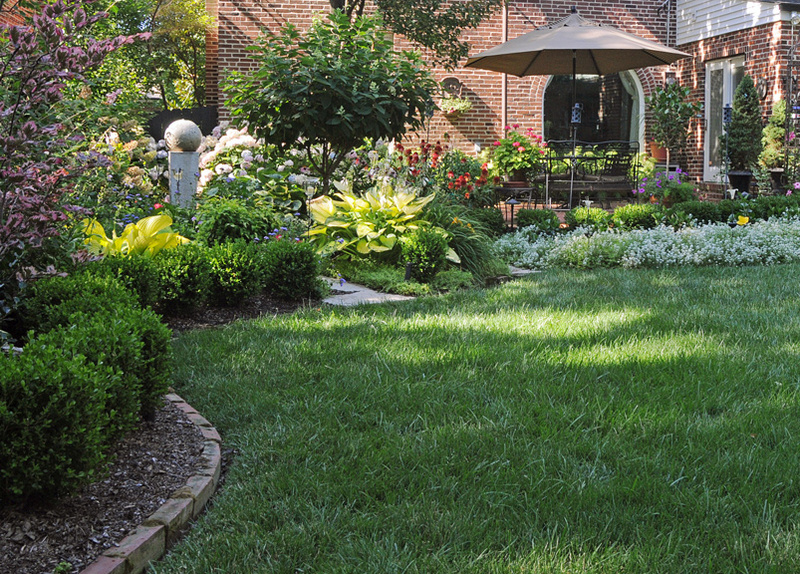 Though small in square feet, Carol has maximized her garden space by selecting small specimen trees and shrubs and getting maximum impact from tried and true plants such as gold-leaved hostas. 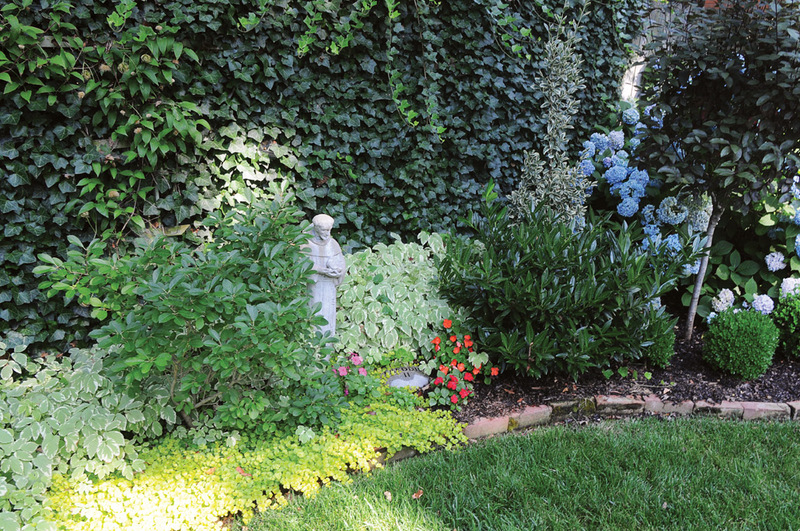 In the past eight years, Carol has taken the small, 50-by-70-foot space and filled it with 12 small specimen trees, flowering vines, lush shrubs, perennials and annuals, all set out in curvaceous, boxwood-edged beds that line three sides of the landscape. “I’m having the best part of my life right now,” she says as she strolls around the perimeter of her yard, pulling an occasional weed and gathering a fallen twig or two. At the same time she just happens to mention that last December, she celebrated her 80th birthday. “It’s never too late to have something special and something interesting in your life,” she adds in affirmation. Carol knew from the moment she set eyes on the green space that would become her garden, what could be done. She and her husband Gordon were house hunting. Both had been married previously and they wanted a home with no ties to either of their lives. They happened to pass by a University City home “For Sale by Owner.” When they knocked on the door and were invited in, Carol was immediately hooked, but not by the home’s interior. She took one look through a huge, arched picture window in the dining room and saw, perfectly framed, the yard in back. For Carol the beautifully situated landscape was a chance to return to the gardening roots of her childhood, when she delighted in being around Carter, who worked as a gardener for her great-grandfather Henry Young. “My great-grandfather said he hired Carter because he had holes in the knees of his pants, not in the seat. He (Carter) was one of the finest gentlemen I have ever met,” she notes, recalling the infinite patience he showed as he taught her how to root cuttings and create new plants. While she claims to be an “absolute amateur” when it comes to garden design and plant selection, Carol makes it clear that she never hesitates to “ask a thousand questions” at garden centers and quickly run to the “plant doctor” desk at the Missouri Botanical Garden with a leaf or a twig that looks as if it might be in distress. She also is quick to try new plant material and, if something doesn’t do well, to move it into what she terms “the hospital,” an area to the side of the garden that she can watch carefully. The garden design is her own. She began by filling in the center of a circular brick patio at the back of the house that had contained a birdbath and pachysandra. From there she worked to give the garden graceful, curving lines by outlining shapes with a garden hose and eventually defining those arcs with brick edging and small evergreen boxwoods, determined to make the space as attractive in the winter as it was in spring, summer and fall. As time went on, Carol added stepping stone pathways, a sculptural fountain, an arbor and finally a Fond du Lac stone walkway from the front steps of the house to the back garden gate. 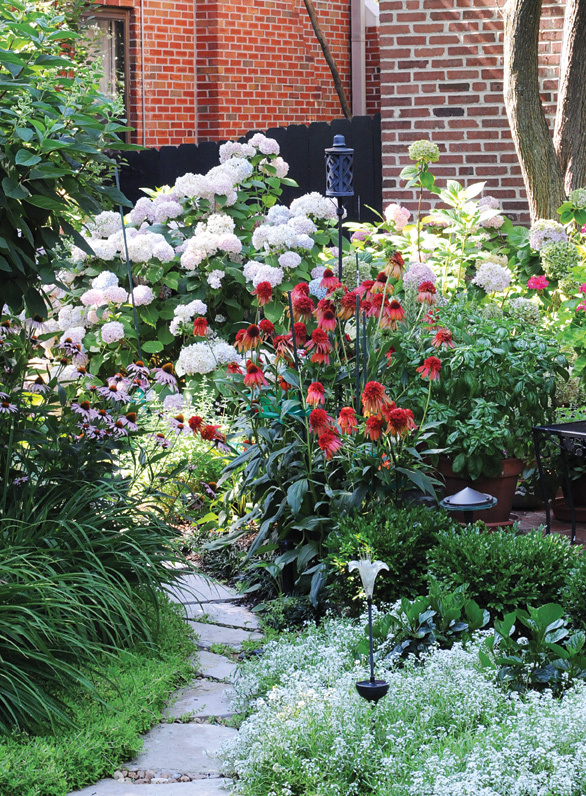 Privacy fencing softened by shrubs and flowering vines keeps the garden secluded and calm. The space is small enough that each tree, shrub and vine can draw individual attention from both Carol and garden visitors. She is quick to point out the serviceberry, tri-colored beech, topiary holly, miniature crab apple and “dear little Korean lilac.” She delights in trying and pointing out new plants such as a shade-loving aucuba, with its evergreen yellow speckled green leaves that will thrive in a protected spot in St. Louis gardens; an akebia, also known as a white flowering chocolate vine; and a double, fiery orange coneflower called ‘Hot Papaya.’ The addition of watering and lighting systems keeps the garden refreshed during the day and luminous at night. For Carol, who describes herself as a “go-go, high-energy, people person,” working in the garden is her “quiet downtime. I actually prefer working all by myself,” she says. “It’s where I recuperate.